Two from Scotland - One Fruity and the other Hard. Ever heard of a Tayberry? I never had until I picked up this beer. Hailing from the Williams brothers brewery this beer is called Róisin pronounced just like the Irish version of the name such as Róisín Murphy and for non Gaelic country inhabitants is Row-Sheen. Apparently a Tayberry is like a cross between a Blackberry and a Raspberry. Also the beer, like the label is supposed to be pink, although this is not true. It is more an amber brownish red. The head is non existent, the Tayberry flavour though is anything but. This reminds me of any English ale though with very little bitterness and instead it has a tarness from the tayberry. Quite refreshing if a little odd since I am not used to the fruit. My wife enjoyed it so I will get some more in the future. 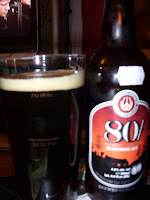 Also from the same brewery is an absolutely fabulous beer called, well 80/ after its style. The malt is in your face from the beginning. There is a beginning of caramel and toffee before the roast grains kick in then a lingering spicy bitterness leaves you wanting more. It reminds me a lot of Clotworthy Dobbin actually. I loved this beer and want some more. My only previous experience of 80/ was the kegged Tennent's and McEwan's ones I used to occasionally drink when I lived in Scotland, and they pretty much put me off the style. I must give this version a spin, so. The Tale Of The Ale: Two from Scotland - One Fruity and the other Hard.